Unless you have a Celiac child or family member, you may not realize how sensitive to gluten these individuals are even to topical applications. My father got sick from hanging wallpaper with wheat paste, for example. Play dough is another example where children benefit from gluten-free products. Mama K’s Aromatic Play Clay is a 100% natural modeling clay made using only certified Gluten Free flours, Kosher salt and organic essential oils. No synthetics, no artificial dyes, nothing but natural. Feels great to play with. Both children and adults benefit from the tactile and olfactory magnificence of this clay. Knead, mold and shape your cares away. This clay uses the power of aromatherapy to soothe (lavender), uplift (sweet orange), ease the anxious (bergamot), inspire (lemongrass), balance (geranium), refresh (cardamom )and create complete relaxation (chamomile). The consistency reminds me homemade play dough, and the scents are not overpowering. The essential oils sure beat the smell of [amazon_link id=”B000V64HZ2″ target=”_blank” container=”” container_class=”” ]Play Doh[/amazon_link]. Would I buy this product? Probably not. It is almost $5 per tube or $23 for a set of five (about twice the price of commercial Play Doh). The price is a little high, but the ingredients are organic and gluten-free. 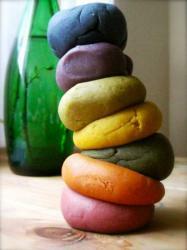 I am sure there are Celiac play dough recipes online to make your own. If you aren’t the cooking type, then this is a great product. It’s always fun to discover new music for children with positive, environmental messages. I usually accept requests to review children’s music with trepidation. I am rather picky when it comes to music, and children’s music often annoys me. I’m happy to report, that is not the case of Joe Reilly. 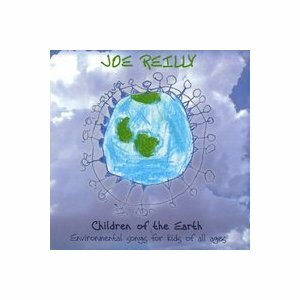 Singer Songwriter Joe Reilly brings message of environmental stewardship to “Children of the Earth” in new CD Joe Reilly is a singer, songwriter and environmental educator at the Leslie Science and Nature Center in Ann Arbor, Michigan. His way of working with children is empowering, inspiring, and educational. Offering an interactive musical program called Children of the Earth, Joe helps people of all ages deepen their relationships with themselves, each other, and with their natural environment. Appropriate for preschool through middle school, Joe brings smiles to audiences while teaching ecology and environmental stewardship with creative lyrics and catchy melodies. After more than two years of writing songs with and for children, Joe is ready to release a full-length album of environmental songs for kids of all ages. Titled Children of the Earth, the album includes a chorus of kids’ voices singing with Joe and his guitar on several of the twenty-three fun and educational tunes. The songs teach environmental science and ecological stewardship while entertaining kids and adults alike. Children’s voices offer brief interludes between songs as they candidly speak about what is important to them in nature and as they teach us how we can better protect our natural environment. Let’s Go Outside is Joe’s new album, which you can support and order via Kickstarter. Inviting kids outdoors to explore nature, sing, dance, and play is at the heart of Let’s Go Outside. The album of 18 fun and educational tunes begins with a “Wake Up” song to help kids and their families start their day smiling and singing. Let’s Go Outside takes kids on an imaginative musical journey to examine natural science from the perspective of decomposers, water, a watershed, amphibians, and the strange scavenger raptor the turkey vulture. In addition to these topics, Let’s Go Outside introduces young listeners to broad themes of living in balance and sustainability, the causes of and solutions to global climate change, the problem of endangered species, and what comprises a community. The album concludes with a “Good Night” song, helping kids wind down after a long day of playing outside, bringing a sense of calm gratitude to little bodies and minds. Would I buy this music? Yes. I like that Joe is an environmental educator and financing these projects via Kickstarter. In fact, it is hard to sit here and finish this post with chorus of “Let’s Go Outside” playing. I want to go outside! These will be fun cds to play in my preschool classroom. [amazon_link id=”B0012NX5OM” target=”_blank” container=”” container_class=”” ]Nature’s Path[/amazon_link] is one of my favorite organic labels, not only for the great flavors and quality of their products, but the company’s commitment to remaining independent in a time when giant food corporations are behind your favorite organic labels. Looking to spread the love? $1 of every US sale goes to fund microcredit programs that help women lift themselves and their families out of poverty. 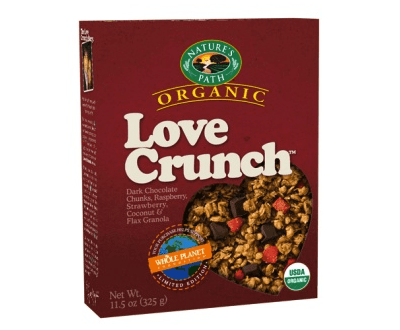 In Canada, when you buy a box of Love Crunch, we donate one to the food bank on your behalf. Each purchase supports the Whole Planet Foundation, and there really is a love story behind this granola! SAP: The SAP is a mix of wheat starch and acrylic polymers which do not contain phthalates. These landfill training pants have won the Nordic Swan Eco-Label and are considered “greenest disposable in Europe”. These Danish diapers do resemble more commercial landfill diapers than typical eco-friendly brands. Would I buy this product? No. I don’t believe in training pants. It was not part of our toilet learning. We went from cloth diapers to underwear. I really believe there is no benefit to the added step of training pants, even if using landfill diapers. The only benefit I could see is if you had a child with special needs that had difficulties with toilet learning. I did use landfill diapers on rare occasion for traveling and sometimes nighttime, of which I might consider this brand. 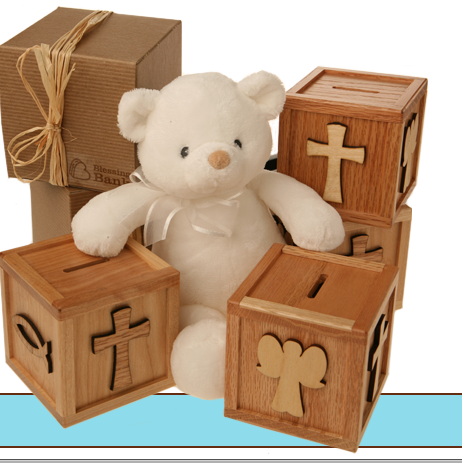 Blessing Banks are wooden cubes with Christian symbols adorning the box. The purpose is for children to collect their spare change to either give to their church or some other charitable institution. On this Easter Sunday, a Blessing Bank would be a nice gift for a religious family. Based on Jesus’ words in Acts 20:35, Blessing Banks are more than a gift; they are a lifelong lesson in the blessing of giving. They are available in handcrafted hardwoods for boys and girls, hand-painted ceramic and also in a hammered, silver-plated option. And Little Blessing Bags are a convenient way for collected change to bless someone with an immediate need. These little wooden banks truly are beautifully crafted. Would I buy this product? Probably not. I really like the concept, but I wish it had a broader reach than just Christianity. Children should learn philanthropy at an early age, and ever little bit counts. I think the same product could be targeted to families of various religious beliefs, but then again, the obvious target audience would find this a great gift. I have to comment on the remark about Bambo Nature Diapers. I am one of a handful of vendors in the states that sells the products and they one of the best diaper products available in this country. The diapers in particular are extremely popular with my clients and regularly purchased on my website. As for the training pants, everyone has their own opinion as to whether they are the way to go. As a mom, I did not believe in them and found letting my kids run around naked and encouraging them to go potty was easy training for them and me, but lots of parents love the concept of diapers that look and function like undies and they sell well. 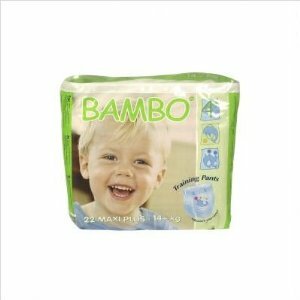 All the Bambo Nature products are 75% biodegradable and with a little cutting can be made 100% biodegradable. Check out my website for more info and to order at the best rates.